Seeing is believing in the Dark Circus, where truth and illusion collide, and where the heart of a holy conspiracy pounds… At an art auction in Madrid, Elías Segado, a religious art appraiser and detective, is getting ready to secure a painting for the bishop of Cartagena. But in a brilliant sleight of hand, the iconic work is stolen, drawing Elías into the confidence of its corrupt and seductive thief. 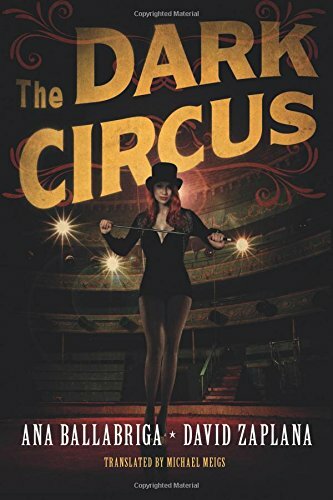 Her name is L. Raised by her uncle in a threadbare circus, she lived by the twisted rules of the carnies she grew up with. Exploited for public awe, and ritually abused for private pleasure, L came to endure all that was encouraged by the circus’s perverted sense of righteousness. Debauchery is the only thing she trusts. But behind the curtains of the Dark Circus is a greater secret to be avenged. And she needs Elías Segado to help expose it. As their worlds of sacrilege and devotion collide, so do temptation and indulgence—and a faith in both good and evil, where morality is just another illusion. But to survive the mystery, Elías must also dare to accept something more shattering: everything he and L have in common.